High dynamic range video is the biggest thing to happen to movies and TV since the switch to 4K, but what is it? So, you've just about wrapped your head around the benefits of the 4K UHD resolution revolution and now the TV tech world is trying to get you to care about another new acronym. But HDR, or high dynamic range, is something you definitely should care about as it's arguably going to offer the biggest visual change since the move from standard definition to HD video. HDR content and compatible devices are increasing in number, with stacks of 4K TVs now supporting HDR as well as other devices such as Chromecast Ultra. With Netflix, Amazon and YouTube having joined the HDR party and Ultra HD Blu-ray offering HDR support for the new optical disc format too, we'll soon have multiple devices to display the burgeoning high dynamic range content offerings. Now the chickens and the eggs are finally coming together then it's time to get serious about this advanced new visual standard. At its most basic HDR is a method of getting greater variance in contrast and colour into moving images. That means having a wider range of colours, which also involves having greater levels of contrast. 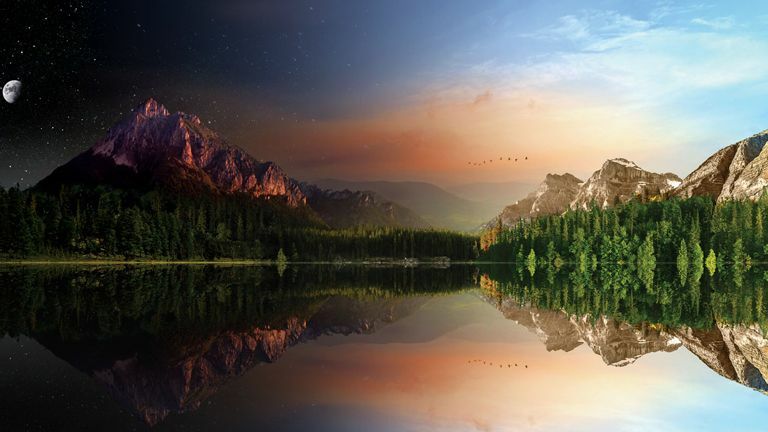 It's been seen most in still photography up until now, where multiple exposure settings are used to take separate pictures and are then combined into one stunning image. That means getting more detail into both the brightest and the darkest elements of a picture. It's essentially the same idea for the ol' moving pictures too. Inevitably though it has to be a more sophisticated setup to capture many more images every second. High dynamic range video then is shot with an overall expanded colour range, which means a HDR source won't just be about blacker blacks and brighter whites, but also about far greater colour definition too. The idea is to bring video fidelity more in line with what the human eye actually sees. It's simple to see what that means when you're sat inside looking out of a window during the day. Put your phone into camera mode and point it at the glass and you'll see the daylight world outside in a fair amount of detail but everything around it will appear far darker. Shift the focal point to somewhere inside the room, but with the window still in frame, and the outside world will likely become a blown-out, glaring bright spot as the darker room gains detail. This is something your eyes don't do as they can capture a wider range of colour - and something HDR cameras don't do either. "This allows [filmmakers] to deliver content with brighter highlights, we can make things more natural, more life-like. Things like reflections, halation of light, specular highlights, glint off a car, things that we see day-to-day," explained Stuart Bowling, Dolby's Director of Content and Creative Relations as we checked out the stunning Dolby Vision HDR cinema system. As we're gaining more actual detail in the resolution of images it makes sense for them to become more detailed in their colour and contrast too. It this expansion that will make Ultra HD visuals seem more natural, less artificial, but also more vibrant too. "HDR ensures you're seeing extremely accurate colours that have a higher range," said Netflix's Noesjka van der Helm about the upcoming streaming standard. "So instead of a ray of sunlight appearing washed out and white, you're able to notice the orange and yellow hues instead. It gives a much more exciting viewer experience with more colours, brighter highlights, better contrast and shadow detail." Where can I watch HDR video? Well, therein lies the rub. As 4K content is pretty thin on the ground it's worse still in terms of high dynamic range video. The main sticking point is the need to have HDR used right from the start of filming if you want to get true HDR. But Dolby and IMAX have been working to get the film industry at large engaged with the new format and the new camera/projection technology for the cinema experience. "At Dolby we're spending a lot of time with the major filmmakers," says Stuart Bowling. "Certainly, unanimously, every filmmaker we're working with is completely blown away and in love with what they can actually do now." But HDR cinemas are still pretty rare right now. The nearest Dolby Vision cinema to us is in Hilversum in the Netherlands. In the home though things are picking up speed. Both Amazon and Netflix have worked to integrate HDR into their streamed outputs. "HDR provides a truly stunning visual experience and we're excited that our original series, Mozart in the Jungle and the pilot episode of Red Oaks are the first titles to be made available in the unmatched picture quality," said Jay Marine, Vice President Amazon Instant Video EU. Netflix is also in the process of getting HDR into its stream too. "With 4K screens we have the resolution we need. Now it is about getting better pixels, not more pixels, to give viewers a much more exciting TV viewing experience,” explained Netflix's van der Helm. “Put simply, HDR is a way to bring greater definition and variation of colour to images." Some of Netflix's original series are filmed with HDR in mind - such as the cinematic Marco Polo. But there will also be ways for HDR to be 'back-rendered' into existing video too. HDR nows works via YouTube. As of 7 November 2016, YouTube began rolling out the content, complete with an HDR playlist section. Initially this is filled with user generated videos that were shot on HDR capable cameras. That means that anyone can now upload HDR videos directly to YouTube. Of course there are plenty of professionally made HDR shows and movies which, rights permitting, may appear on YouTube soon. Although we'd expect this is reserved for those paying to watch these premium videos. The BBC has been working hard to push its video to a higher level of quality, beyond even 4K and HDR. The result is a new format called Hybrid Log-Gamma (HLG) which will mean the BBC can air new colours never seen on TV before.Today the BBC iPlayer will be showing off footage from Planet Earth II that has been rendered in UHD HLG format. If you have a HDR and 4K compatible TV then when you open the BBC iPlayer app you’ll be prompted to watch the new video content. There is a four minute clip that can be viewed between now and the new year. Technicolor is working on an open standard that will upscale standard range (SDR) video to increase the colour and contrast depth. The new system allows real-time access to the colour information in a video, giving content providers the means to directly control the highlights, lowlights and mid-tones of a moving image. If that process takes off - and is able to give a close approximation of the intensity of a true HDR source - then the problem of a dearth of HDR content could be a rapidly solved issue. Combine that with the upcoming Ultra HD Blu-ray optical disc standard, with its HDR support, and we'll soon have all the classics remastered in UHD 4K as well as back-rendered into high dynamic range too. What do I need to watch HDR? But for the rest of us it's a case of getting hold of a brand new, HDR compatible set. Something to keep in mind if you're in the market for a new high-end TV right now. So, whether we're talking about the big-screen or home cinema experience, high dynamic range movies and TV shows are what we're going to be talking about from now on. If you're in any doubt about what is the best 4K TV, then check out our buying guide. There are plenty of HDR-capable choices.